I haven't made a card for Friends With Flair in some time, maybe since February! So I thought I'd jump back on the band wagon and get on done! This card is made using a recent Stamp Of The Week from Unity Stamps! I really like this one. Great colors. Gorgeous card! I love how you stamped onto that beautiful background you created! That is an awesome look! That is a great card. A beautifully unique card. I love the technique you have used. Just beautiful! Fabulous. I love the background ink! A lovely card!! 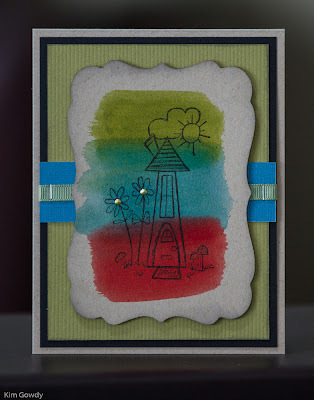 Love the colour wash with the sweet house image. I'm loving the three colour background for your stamp! It looks great! love the idea of creating a background by painting! Oh, I really like how you stained the background then have a simple stamped image over the top. brilliant! Love the color swipes you made! Love Friends and Flair Friday and always enjoy seeing what everyone creates. I may have to scraplift this technique. Great card! Lovely technique with this image, Kim. Really great distress stain background. Fun card! I adore the color streaks! Adorable card! I really like the color swipes. That is just so cheerful, and I may have to case it! Such a pretty card! I love how you showcased this adorable stamp! Adorable. Love the multicolor background!